Every summer we make reading a priority. We schedule it into our daily routines. My kids set goals every summer for how much they want to read. It's really important to me that my kids read during the summer. Check out those posts to see how you can incorporate reading into your summer (both independent reading and reading together with your kids). This summer we'll be reading again. My kids have been reading more all through the school year so their skills have improved a lot since last year. Their interest in reading has increased too, mainly due to the types of chapter books they are reading. My kids are not as interested in the library reading club this year so I'm not sure if we'll incorporate that or not. And I'm still debating if I'll set up a little competition to help them keep their motivation up all summer. I also haven't finished the rest of our plans for this summer yet (the kids still have 2 1/2 weeks of school so I've got a bit of time! ), but I'm planning ahead for our reading times so I can get all the books we want from the library. Here are some of the books we're planning to read this summer. Hopefully it will give you some ideas for your kids too! My daughter started reading the Little House on the Prairie series this year. She's 8 years old and is in grade 3. They studied pioneers this year at school and her teacher started reading Little House in the Big Woods to her class during that unit and ran out of time to finish the book. So my daughter signed it out from the school library. It was by far the biggest book she'd ever attempted to read! I was looking back on my daughter's reading development and she's come a long way! 3 years ago she was barely reading and needed help with the words in her picture books. 2 years ago she could read independently but was still mainly reading picture books. Last year she graduated to short chapter books, but she still mainly read books with lots of pictures (like the Thea Stilton series and the Candy Fairies books). So when she said she wanted to read Little House in the Big Woods I wasn't really sure she would actually do it. I mean those books are LONG! But she did :) One chapter at a time usually, but sometimes more. And when she finished that book she asked me to get Little House on the Prairie from the city library for her. She's been working her way through that one now too. She plans to keep reading the rest of the series. Which is great because we bought it for her a few years ago when we came across a great deal and I didn't want to give it to her until I knew she'd really appreciate it. I loved the Little House series myself and I'm so excited she's enjoying it now too! I'm sure my daughter will still read some of her picture books (she's not ready to part with them yet! ), as well as books like the Thea Stilton series and the Candy Fairies series. But I'm excited that she's also interested in longer chapter books with a little more content in them. My son is 11 and just finishing grade 5. He started reading the Percy Jackson & The Olympians series at school a few weeks ago and he is absolutely loving these books! I'd never heard of the series but his teacher has them in her classroom and several other kids apparently liked it so my son decided to read the first book. They're fictional books based on characters from Greek mythology. They're long books (the longest he's ever read by far) but he's reading them quickly. There are still 2 more books in this series as well as supplementary books (graphic novels, a series guide book, and guides to Greek gods). And there is a sequel series after this one with 5 books as well called The Heroes of Olympus. We've been reading through the Chronicles of Narnia series for the last few years. I usually read a chapter or two each day to the kids whenever we were home. We made it through The Magician's Nephew, The Lion, The Witch, and the Wardrobe and The Horse and His Boy two years ago when we were home quite a bit. Last year I worked a lot and the kids were in day camps so we didn't have quite as much time to read. We read Prince Caspian and The Voyage of the Dawn Treader. We started The Silver Chair but didn't finish it and ended up reading books from school once summer was over. This year we plan to go back and read The Silver Chair and then read The Last Battle. The kids are excited to see how the series ends. Once we're finished the Narnia series I'm going to let them choose what we read next. They mentioned possibly starting over and reading it again since it's been so long since we read the early books. I like that idea but it's also good to read some new books together. They have expressed some interest in the Harry Potter series, and I have to admit, I've never read it myself, but I've heard good things about it, so that's a definite possibility. I'd also love to start reading The Hobbit and the Lord of the Rings series to them. They both have great imaginations so any of these options will be great choices! Help your kids choose age-appropriate books. They'll lose interest if the books they're reading are too easy or too difficult. Encourage books that support your kids' interests. They'll be more excited about reading if they enjoy the content. Join a summer reading club. These are often offered by libraries, book stores, and publishers. Many of them offer rewards for achieving reading goals and fun activities along the way. If you can't find one, create your own with stickers, treats, etc. Build a reading time into your daily routine. Choose a time each day when your kids know it's time to read. Be consistent so it becomes something to anticipate. Read to your kids. In addition to encouraging your kids to read on their own, they will develop a love of reading if they hear you reading to them. You likely read to your kids when they were very young but it's important to continue reading to them when they're older too. Choose a series and read a chapter or two every day. This is a great way to keep the interest in reading alive all summer. If your kids get into the series, they'll be asking you to read more! 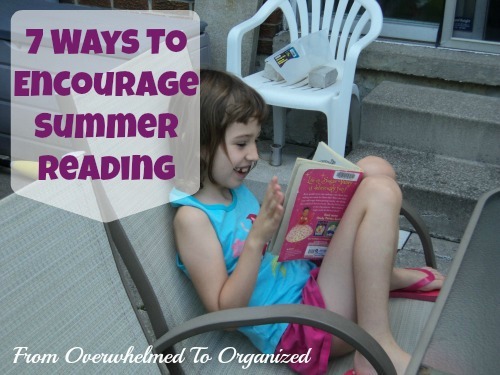 I hope these tips help you create a great summer of reading for your kids! It will be worth the effort and you may spark an interest in reading that will last the rest of your kids' lives! You can check out my summer board on Pinterest for more ideas to help you organize your summer! Do you encourage your kids to read in the summer? What kinds of books do they read? Any more suggestions for my kids? Oh my kids LOVED so many of those!!!! I was going to say they loved the Percy Jackson...then figured out they loved most all the ones you listed!!!! My eldest cried when we finished The Last Battle. He had enjoyed the entire series so much that he didn't want it to end. I finally read The Harry Potter series last summer and loved it. I read each book and then, watched each movie again. Sometimes, we like to read the books and then go see the movies. Be warned though, the first Percy Jackson movie was awful and didn't follow the book well at all. I don't think we even bothered with the second movie. We've been slacking off a bit on our reading this summer so this post was a good reminder that I need to get them back into it. I love this. We participate in our county libraries summer reading program which is always fun. I forgot about Percy Jackson! I think my son would like that! Thanks! I am a big reader to this day, and volunteer at my local library, because my parents encouraged it and made it fun! Great "proof" that encouraging reading works Hazel! Thanks for sharing your story! Summer reading was always a highlight in my home. Our library runs a wonderful program that encourages kids to read, and provides great prizes at the end of the year. My oldest girl almost couldn't put books down, had them falling off of her bed at night. I also enjoyed reading what they were reading, because it is always more fun to read a book when you can talk to someone else about it! I remember having books falling off my bed too Seana! Great idea reading what your kids are reading. My son is 4 and for the last 2 summers we participated in our library's summer reading program. It was great fun! I'll have to remember some of these books for when my little guy gets older. Good job starting the library club so young Sarah! Great selection of books! My kids loved all these series when they were younger. I loved the Harry Potter series. They are in high school now and are interested in more realistic fiction books. But that's not my favorite type. So instead of reading together, we spend time weekly talking about what is going on with our respective books. I'm curious to see what kinds of books my kids enjoy when they get older. What a great idea to discuss them together Sabrina! When I was a kid, I'd always stock up on library books before we went to the cottage for two weeks, and I'd usually read them at least twice! I feel sorry for adults who didn't fall in love with books at an early age. The library was my friend when I was a kid too Janet :) I think it's really hard to enjoy reading as an adult if you didn't have that seed planted when you were younger.